This is one of the most impressive Round Towers I have encountered to date, similar to the one at St. Brigids Cathedral in Kildare which you can read more about HERE with the exception that this one has its original conical cap, although I was unable to access the interior. 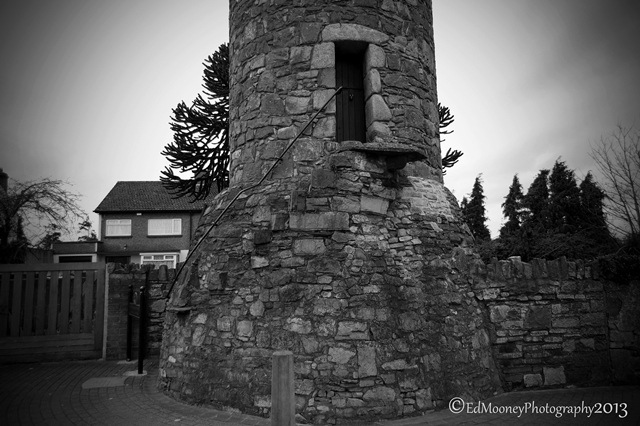 The tower at Clondalkin is surprisingly well kept given the fact that it lies on the sidewalk of a busy street in the center of Clondalkin Village. Clondalkin is said to have been founded by Saint Cronan (Mochu) as a monastic settlement on the River Camac over 1,400 years ago. The round tower was built around a century later (circa 700 AD) as part of the monastery. 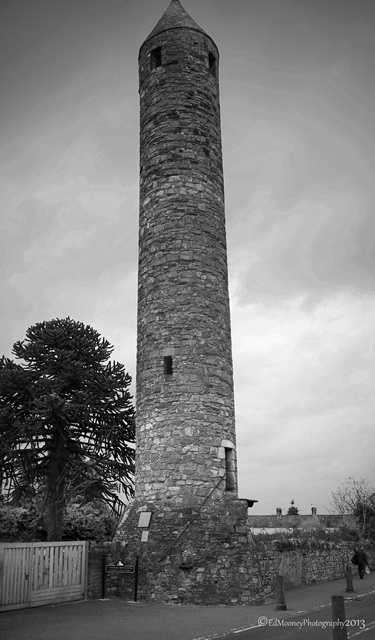 Clondalkin was sacked by Vikings from Denmark in 832 AD, and the monastery was burned to the ground. One of the early Norse kings of Dublin, Amlaíb Conung, built a fortress on the site in the middle of the 9th century. In 867 a force led by Cennétig mac Gaíthéne, king of Loígis, burned the fortress at Clondalkin and killed 100 of Amlaíb’s followers. The district remained under Danish control until the Viking defeat by Brian Boru at the famous Battle of Clontarf in 1014. Clondalkin witnessed another historic event during the Norman invasion in 1171 when there was a battle there between Richard de Clare (Strongbow) and the last High King of Ireland Ruairi O Conchúir. I could find no record mentioning restoration of the cap, which would suggest that it may be original to the tower. Although the angle is lower than most other towers that still retain their conical cap. 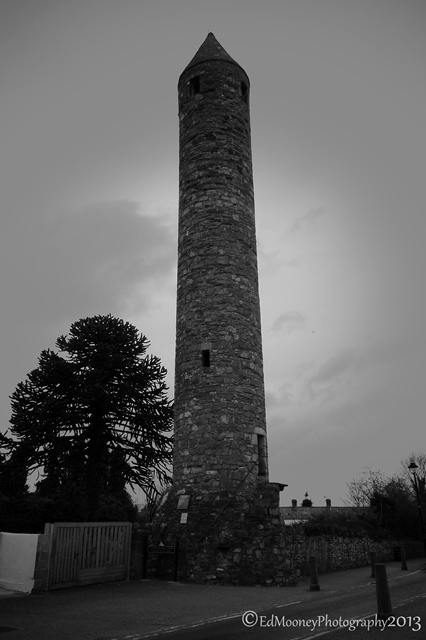 The most obvious feature of the tower in Clondalkin is the skirt-like bulge at it’s base. 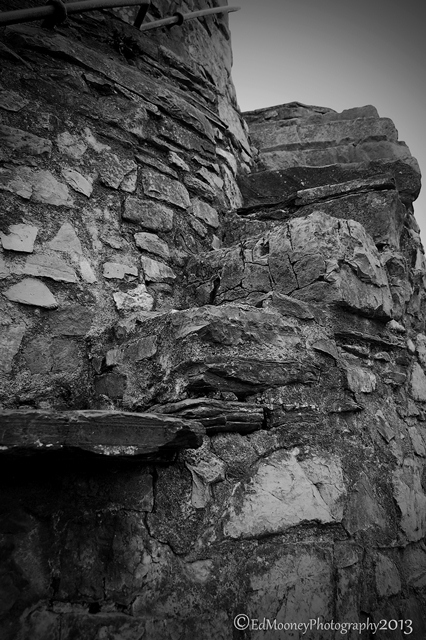 There have been built nine irregular steps to the doorway along with a metal handrail in a winding configuration. Apparently it was once possible to climb the tower. Since the steps begin about 1.5 meters above the pavement, there must have been additional steps below this. The steps culminate in a wide stone landing outside the doorway. This large slab overhangs the pavement supported by a single corbel. The view from the top of the tower would be spectacular, but it appears that the tower has not been available to climb for some time. The floors and ladders that were installed in the late 18th/early 19th century may be in a dangerous state of repair. The base of the tower is bisected by a stone wall, so that part of the west side of the bulge lies in an unkempt garden on private property. For more of my images, why not visit my Website,or follow me on Facebook, Instagram or Twitter. Photographer, Blogger, Ruinhunter, with an unhealthy obsession for history, mythology and the arcane. This entry was posted in Diary of a Ruinhunter, Historical, Photography, Places of Interest, Round Tower, Ruins and tagged 700AD, 832AD Norse, Amlaíb Conung, battle, Battle of Clontarf, Brian Boru, Camac River, Cathedral, Cennétig mac Gaíthéne, Clondalkin, Conical Cap, Denmark, Dublin, Fortress, High King of Ireland, Invasion, Kildare, king of Loígis, Mochu, monastery, Norman, Richard de Clare, round Tower, Ruairi O Conchúir, Saint Cronan, St. Brigid, Strongbow, Vikings, Village. Bookmark the permalink. Ed, what a absolutely wonderful tower. I was recently in Bolgar, Ru. which had several towers which they call minarets. You mentioned that the conical roof may have been rebuilt, it the only thing that is different between the one here and the ones in Bolgar. What is curious is that I believe that they both built in the same time period, my research tells me that the city of Bolgar appeared approximately around 660 A.D. and I’m sure the minarets didn’t appear until later. Love the pictures. Thanks for sharing. Very interesting, the conical cap was standard for the time, but there are a number of variations which I have found such the one in Kildare which has Battlements. You can actually climb a number of ladders and get to the top of this one. We also have a number of Maetello’s scattered around the coast of Ireland but these date from the Napolean era. They were used as a watchtower. These minarets are very interesting, I have come across some in Muslim areas such as Turkey. Do you know what they were used for? Bolgar started out as a settlement of those who followed Islam. I believe the towers where used for several purposes. The first was probably to call prayers to the city. The second might have been to be watch towers, but would need to do more investigation in to this line of thinking. Currently I’m working on an article that will share about, Who the Bolgars where. It takes a while to do a in depth study of who they where, so keep an eye out. I will be posting it soon. Awesome. I used to live in Ireland as a child and remember being taken to see towers like this by my parents. If I ever make it back to Ireland, I’m hiring you as my guide. Loving your posts! Thank you for the history and wonderful photos. Who built the towers (old and new)? Great photos! I hope to go to Ireland someday. That is a beautiful structure! So simple and elegant. I have a feeling that it was the Culdees who had a liking for this type of tower but I might be mistaken. There is a similar one in Abernethy in Scotland. Hi Joe, a very valid point, the Céli Dé could have very well been responsible for these as they were scattered across both islands. Quite an interesting group, mixing the old ways with the new religion. Im sure there would have been more examples to be found in England had it not been for the dissolution of the monastaries. Yes, indeed. Henry VIII had a lot to answer for! Thanks Noel, I remember that 51 well, myself and my Brother used to walk up to Newlands Cross from Kilnamanagh every saturday to get it and visit our Gran in Inchicore. Not yet Noel, Im now living out in the midlands, so im working my way through the tallaght area when I can, its on my list of places to visit. Irish and Udmurts Share "Redheadedness"